Rebetiko, plural rebetika, (Greek ρεμπέτικο and ρεμπέτικα respectively) is the name for a type of urban Greek music. 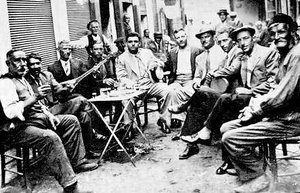 Rebetika are the songs of the Greek underworld, sung by the so-called rebetes (Greek: ρεμπέτης). Rebetes were unconventional people who lived outside the social order. They first appeared after the Greek War of Independence of 1821. The songs, often compared to genres like American blues, are full of grief, passion, romance, and bitterness. They are generally melancholic songs telling of the misfortunes of simple ordinary men. The most likely derivation is rembet, an old Turkish word meaning 'of the gutter'. Some people claim that it derives from the Serb word rebenòk (pl. rebia'ta), which means 'rebel'. The word rembetiko is a corruption of the archaic and also modern term remvastikos (meditative) and is derived from the verb remvo or remvazo, which literally means 'I wander', and in the figurative sense of 'my mind is wandering in an anxious mood'. The support enjoyed by rebetika at the popular level was not matched among the arbiters of morality and cultural values. The music was heavily censored in the 1930s. But the censorship did not kill rebetika; far from it. Immediately after the Second World War it witnessed a major boom in Greece, which lasted through to the mid-1950s. A boom explained in part, perhaps, by the sufferings and social upheavals caused by the Civil War and in part by the economic pressures that contributed to the growth of urban centres such as Athens and Thessaloniki. 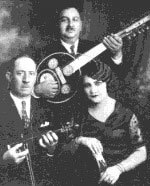 During the past twenty years all the main exponents of rebetika - the heirs of the singers and composers who came from Asia Minor after the military disaster of 1922 - have died. They have left behind a wealth of recordings, which are slowly being collected and catalogued by rebetologists. In the meantime new generations of singers and players are emerging, to keep the tradition alive. Not only in Greece, but in Greek communities in the US, Britain, Australia and elsewhere, there are clubs where the old songs are sung and enjoyed and where a tradition of new songs is being forged. 1942–1952 — the era of discovery, spread, and acceptance. At the end of the 19th century the Kafe Aman arrived in Greece and Asia Minor. These were coffeehouses in which the habitués amused themselves with lively music. These rooms constituted one of the cradles of rebetic song — along with the prison, the tavern, and the opium den. 1922 was the year of the Asia Minor Disaster, which was followed by population exhanges in accordance with the Treaty of Lausanne. Many Asia Minor Greeks were settled in the larger cites of Greece, bringing with them their traditional music. From the admixture of the music of Asia Minor with elements from Greece proper, the rebetic style came into being. In this period, the themes of the rebetika revolved mainly around love songs and songs with references to illicit activities (such as narcotics). The influences of the music of Smyrna were profound, given their unrivalled pathos, and at certain times it is difficult to distinguish the rebetic song from the Smyrnian. Gradually the rebetic variety acquired its own peculiar character. In 1932, the first recordings of rebetika arrived, made by Markos Vamvakaris. In 1936 began the dictatorship of Ioannis Metaxas and with it, the onset of censorship. Consequently the album was sanitized and the references to narcotics, opium, etc. vanished from the recordings. Yet the recording of illicit themes continued, for in that period a great number of Greeks emigrated to the United States, and with the emigrants went their rebetika. Many noteworthy songs were recorded, while a synthesis of Greek and foreign music produced many new musical varieties. The basic instruments for the performance of rebetic song are the bouzouki, baglamas and whatever similar instruments one might care to include (e.g. the tzouras). Additional instruments used include the tambourine, accordion, guitar, tonbak, finger-cymbals (comparable to castanets). In a few older recordings, something like clattering glass may be heard. It is a matter of some debate whether the sound is possibly produced by the striking of worry beads against a drinking glass. Some manges are in the habit of making the sound in their music with that method, a practice which was passed on and occurs in some modern recordings. All the rebetika songs are for dancing. Almost half of them are zeibekika and the others are hasapika. Zeibekiko is a personal dance. Only one man can dance it. If another gets up, that is a cause of conflict and a fight with knives. Women were not allowed to dance zeibekiko, (except of prostitutes). The dancer of zeibekiko dances looking to the ground. His face is hard, humorless, almost sinister. Hasapika were danced by two or three rebetes. Women could dance too. These two dances came to Greece from Turkey. Some of the main rebetiko singers and creators include Panagiotis Tountas, Vangelis Papazoglou, Yiannis Eitziridis (Iovan Tsaous) and Manolis Chrisafakis. The next generation included Markos Vamvakaris, Kostas Skarvelis, Yiannis Papaioannou and Vasilis Tsitsanis. Rebetika channel at Live365 — free, advertising-supported; some media players may experience connection problems. Ole L. Smith, 'New Evidence on Greek Music in the USA: [Richard] Spottswood's Ethnic Music on Record', Journal of the Hellenic Diaspora, vol. 18, no. 2, 1992, pp. 97-109. For a scathing and penetrating critique of the state of rebetology studies, see Ole Smith's other major article, 'Research on Rebetika: Some Methodological Problems and Issues', Journal of Modern Hellenism, no. 6, 1989 (part reprinted in Appendix A below). This page was last edited on March 9, 2011, at 14:27.